I've seen a couple of Premier Guitars but nothing like this (must be) Bigsby inspired model. Interesting history. Check out the rim-mounted Bigsby too. I think those are Waverly tuners as they have railroad tracks. Anyone know what these sound like? Pretty cool. Maybe only seen one other in all these years. Retrofret always has the best writeups. They know their stuff. I've seen a few scroll guitars before - mostly red. GDPer ElTuce had one, and an insane sparkle doubleneck too. The natural finish is new to me, and of course, that Bigsby tho. Speaking of connections, have we ever nailed down whether Fransch has anything to do with Franz pickups, which were also made in Queens? The Bigsby is a bit of a mystery at the moment. I was contacted about the guitar a week ago, and have been discussing the Bigsby with a rep from Bigsby/Gretsch. I've seen one or two of these before but never well documented, and hard to place a vintage on. Fred Gretsch apparently has the master for this design which suggests it could be a later incarnation than what this reverb ad suggests. It doesn't really smack of the Bigsby aesthetic sensibility of the late 50s. But then again... anything is possible. If anyone has any intel on this unusual Bigsby vibrato, please chime in here, or send me a note with your info. Bigsby looks kind of like the "shorter than a B7" ones you see on some Gibson Les Paul personal guitars, but it's not the same. 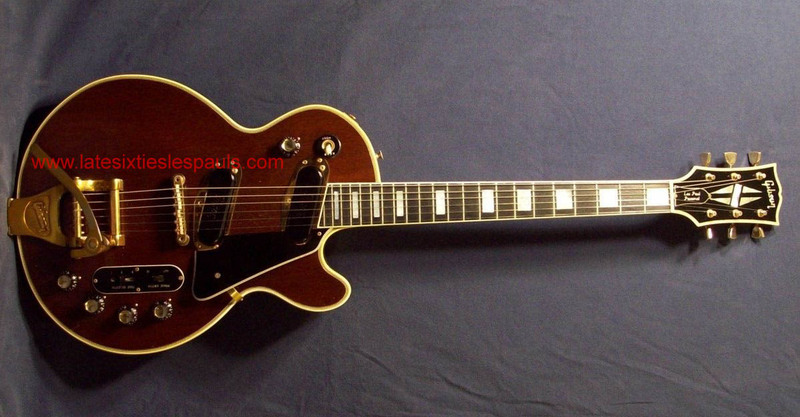 Actually the Bigsby B5 "horseshoe" style unit was originally created from chopped B7 units. Yes....what's weird is that this is later than that. The sloppy Bigsby logo has me wondering how this one came together. If you assume the Phillips head bolt is original (and I can't think of any reason it wouldn't be), then it dates between 1959 and 1962. Yep....most of the chopped B7-B5s were '57 I believe. B5 was fully formed by '59. Thanks Jonathan.... I was hoping you would jump in on this! Yep, I had a red one and so far it's the only one I've seen that wasn't bolt on. The double neck can be seen in this article. ...and a solid Brazilian rosewood neck to boot. If it's all legit it seems not an unreasonable price for something this collectable. Don't know if this helps with the pickup question, but I have these shots from before I sold mine. The Premier pickups are stamped "Fransch, Astoria Queens". It seems like the Guild "Franz" pickups are somehow related, either by an accidental or on purpose conflation, as both were made in Queens and are struturally pretty similar. May just be a coincidence too, but I've yet to hear the definitive story. Ha, I thought I had posted those pictures once before. Pretty sure this is the only 3 pickup variation I've seen. There's a blonde one in the discussion thread OP I posted above.